Archaeologists Seek To Preserve German U-Boats Off the North Carolina shore, recreational divers have explored three German U-boats submerged since World War II ended. Now, archaeologists are getting involved to preserve them. As a teenager during World War II, retired ferry boat captain Gibb Gray remembers hearing the torpedo blasts as U-boats attacked ships off the North Carolina shore. Gray talks about hearing the explosions as a teenager. Richter discusses his first experience on the U-boat and the food he ate. Richter talks about being captured as a prisoner of war in the U.S. Original wartime U-boat hunters were military men trained to destroy German submarines. Today's hunters are divers and archaeologists trying to preserve them. From a government research vessel, they've been diving in the waters off Cape Hatteras, N.C., where Dave Alberg of the National Marine Sanctuaries Program says U-boats were especially active during World War II. The area called Torpedo Junction had "some of the most dangerous waters," Alberg says, calling it a "prime hunting ground for allied vessels." Alberg says German U-boats sank about 80 ships there before American forces finally started sinking the U-boats. Hundreds of sailors were lost. For years, the three German subs on the ocean floor have been popular attractions for recreational divers. But this is the first government expedition to document them and gather information that Alberg says could lead to a preservation plan. U-boats are "a symbol of the war with Germany," Alberg says. "It's the U-boat that invaded the waters of the U.S. and caused the carnage. And so they become that symbol for the hundreds of sailors during the Second World War who lost their lives. That's what we're protecting here." Underwater videos shot by the divers show the submarines are largely intact despite six decades at the bottom of the sea. They're rusty now and covered with aquatic life. But even in that state, the machines still look menacing with their massive hulls, torpedo tubes and deck guns, says diver Tane Casserley of the national Maritime Heritage program. "They're made for one purpose, and that was to kill," says Casserley, a marine archaeologist. "So it's a little ominous to see them now appearing out of the gloom on the sea floor. So I can't even image what it would have been like for a surface vessel in World War II to see these come out of the moonlight. It would have been pretty terrifying." Indeed, U-boats were among the most feared predators on the water, especially in the months just after America became involved in the war — an era when the subs stalked the entire coast between Maine and the Gulf of Mexico. Heinz Richter, 85, was a teenage sailor on the U-352, a German sub that operated within 30 miles of the North Carolina shoreline. "On the way out from our submarine base, the captain announced over the loudspeaker in the sub that we were sailing for the American coast," Richter says. "We then were told that, yes, any kind of ship that we sight is going to be hunted down." Initially, an overburdened U.S. military mounted such a meek defense against the U-boats that German submariners called early 1942 "The Happy Time." 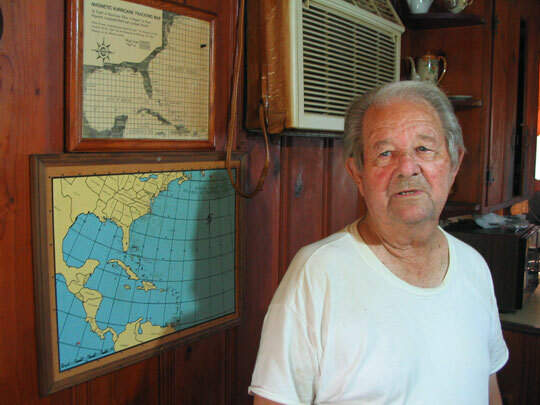 They sank merchant vessels, tankers and warships — some so close to the United States that coastal residents could hear the torpedoes. 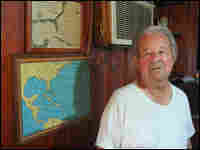 Gibb Gray, 80, was then a youngster on North Carolina's Outer Banks. "People didn't realize what a war we had right here [on] our doorstep," Gray says. "Because there were explosions all the time up here.... In the daytime, it would rattle every window in the schoolhouse." Only after months of losses did the U.S. develop a plan to counter the subs. Merchant vessels began traveling in guarded convoys, while warships and aircraft were mobilized to anti-submarine duty. Richter, the U-352 crewman, remembers when his German sub met its end during an exchange of fire with an American Coast Guard cutter. "They fired four depth charges at us, and they were good hits," he recalls. "And then the captain gave command to abandon ship and then 22 of us got out, and the boat then slid under and 17 crewmembers stayed inside." Scientists on the research boat say they're mindful that sailors died in the three U-boats they're studying. During the expedition, divers worked only outside the subs, at the request of the German government, which considers the insides to be war graves. But Alberg, the expedition leader, notes that other people who have visited the wrecks in recent years haven't been as respectful. He says sport divers and souvenir hunters have gone inside, damaged the U-boats and pilfered artifacts — underscoring the need to protect the relics of Torpedo Junction.